Greetings to you all! I hope you all had a good year, here is how mine went. I spent the first four months of the year in Ghana. I was there for a couple of reasons: firstly for assessing some local development organisations on behalf of a couple of British charities, Future In Our Hands (FIOH/UK) and Plant A Tree In Africa (PATIA), that wanted a report on the Ghanaian organisations' activities, and secondly to join a monkey survey. I started in Accra. I'm not fond of big cities in general, and big third world cities even less, and Accra is no exception -- apart from, surprisingly, having some of the best Chinese restaurants anywhere! Urban poverty always seems more squalid, more harsh, and more bleak than its rural cousin and I got a good introduction to how many people in Accra live when visiting FIOH/Ghana. They have two major projects, one of which is running a small vocational technical training institute. This runs courses in dress making, tailoring, secretarial skills, accountancy, carpentry and masonry. They target people from the poorest areas of Accra in order to give them the means to escape illegal, unsavoury, or menial forms of earning a living. Many of the young women there had resorted to part time prostitution in order to make ends meet before joining the institute. Curiously, this is almost socially acceptable. While full time career prostitutes lose the respect of the culture, occasional prostitution by a young woman who typically earns $0.50 a day gathering and selling firewood and needs extra money to eat, is considered an unfortunate necessity and not a reason for her to be stigmatized. However, the students I interviewed were keen to learn other ways of making an income and put that part of their lives behind them. FIOH/Ghana is also intending to create a model & demonstration farm on some land it has acquired just outside of Accra, using and teaching the concepts of bio-intensive gardening and permaculture. This is being done to teach Ghanaians better methods of agriculture than the shifting cultivation ("slash and burn") used in most of the country today; something that I would find out is very badly needed. From Accra I took an internal flight up to Bolgatanga. This was an experience it itself. The flight was on a small two engine propeller plane -- every seat a window seat! It was cloudy for the first part of the flight, so I didn't get any good views of Lake Volta (the world's largest artificial lake), but it was clear for the last part, so I got really good views of the savanna. I also got to see the animals and locals on bicycles being cleared off of the dirt runway we were going to land on! 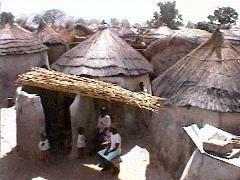 The area to the southeast of Bolgatanga, the regional capital of the Upper Eastern Region of Ghana, is the home of the Tallensi people. The Tallensi Traditional Area is mostly open savanna, characterised by a large tree every two or three hundred metres with the land almost totally in use for the subsistence farming of grains. The Tallensi people live in "compound houses" dotted around the savanna. These are a collection of round, straw thatched, mud huts with their outer walls joined together to form an enclosing compound. There is no running water, no electricity, and the fields are the toilet. I stayed for three weeks with the Tallensi, living in one of the huts in the compound house of the chief of a small, spread out village, called Gbeogo. The chief is the programme director of a local organisation called the Namalteng Integrated Development Programme (NIDEP) founded and run by Tallensi, that works to improve the situation of the people of the area. NIDEP concentrates on two main development areas: tree planting and education. The Tallensi have no tradition of planting trees. This is due in part to a lack of historical need, as the area was forested a couple of generations ago and forests renewed naturally, obviating the need to plant trees. There is also much superstition and taboo against the idea of planting trees, as local beliefs state that trees represent spirits and it would be bad to interfere with the natural course of the spiritual world. NIDEP tries to overcome these beliefs and organises communities to create and maintain tree plantations. The work of planting and taking care of the trees is almost always done by the women, who work voluntarily. After planting NIDEP provides no further assistance, other than advise. The community will water, weed, prune, keep off animals, and otherwise take care of the trees on their own. The entire project is done on a community-works-community-benefits basis. The community provides the land and the workers, and the benefits of harvesting, or profits for cash crops, are shared by the community. NIDEP promotes the planting of "economic" trees, i.e. trees that will help the community economically as well as environmentally. E.g. teak, cashew, mango, guava, etc. They are also working to improve education in the area. The situation with infants and primary schools is particularly dire. The educational facilities, where existent, are crude and basic. 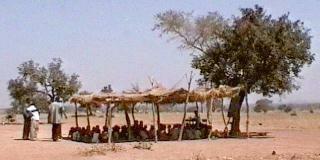 In particular some infants and primary schools are held in a grass hut or under a grass canopy constructed in the shade of a tree with a single blackboard being the only educational equipment. My stay with the Tallensi was very educational for me, and while I was there I spent some time introducing fuel-saving cooking methods. I saw many of their projects but, more importantly for me, I saw something of their lives. The Tallensi are subsistence farmers; they farm during the 4-5 month wet season, hoping to grow enough to last the whole year, and then have no work for the rest of the year. During this period they hold their funerals. Burials are performed a few days after the death, however, as holding a funeral requires the immediate family to house and feed everybody invited (possibly hundreds of people), the funeral can occur many years after the death while the family is saving enough to be able to afford it. A funeral was held while I was there, and it was an amazing event that has no relation to its western counterpart. The funeral lasts for four days and nights, with the drums and chanting going on continuously. Many men come in a goat loin skin and carrying traditional weapons and a mock battle is held. Goats and chickens are sacrificed and the sisters of the deceased dance, naked and with shaved heads, in a deep spiritual trance. Something that was a real delight in the area was the singing. Every little project I visited the local women would form a giant choir and be singing either while they were working or during a break. I think I have more video of "The Sounds of Ghana" than anything else! Also at every project I was, despite my protestations, presented with a gift: by the end of my stay I had accumulated four chickens, eight guinea fowl, and a goat! Of course, I ate some and gave the rest to my host. I was also very impressed by the Tallensis' socialness, sense of community and general happiness, despite their physically hard situation. It made me wonder just how much the western world has traded in exchange for having an increased material standard of living, and also about how development affects culture. After staying with the Tallensi I visited an organisation based in the twin villages of Atuba and Agumishe in a rural area about 30 kms outside of Bawku called the Atuba-Agumishe Community Livestock and Crop Farmers Association. The association was started as an agricultural cooperative and continues to function as one. It's main purpose is that of a farming credit union, making loans in seeds and livestock. Members pay dues which are used to purchase seeds and animals which are then loaned out. 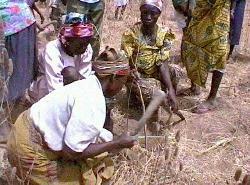 When the association lends out seeds -- typically millet, groundnut, rice, or soy bean -- it asks for the loan to be repaid in seeds when the harvest is in. When it lends out livestock (goats and cattle) for breeding repayment consists of the return of the animal plus a chicken! The association is also involved in tree planting, which was why I was there. It has two nurseries and two plantations in the Atuba- Agumishe area. About 11,000 trees have been planted on these plots over the last 3 years, at an increasing rate. These plots are community land and the women that plant and take care of the trees work voluntarily on the understanding that they will reap the benefits. The nurseries produce seedlings and most of these have been used for the association's own plantations, but many have also been given out to schools and other community groups, to promote tree planting activities in a much larger area. I was delighted to find that the women of Atuba-Agumishe also have group singing in their culture, and added to my collection of local music. I then went to Bamboi, in the middle western part of Ghana. Co-incidentally the monkey survey I was going to join and one of the organisations I had to visit were both based there. The Mustard Seed Foundation an NGO whose prime objective is the building and running of orphanages and schools for orphans and other deprived children. They have correctly understood that, while getting any funding is difficult, it is relatively easier to get one-off capital funding (e.g. to build a school or orphanage) and much more difficult to get year-in-year-out ongoing expense funding (e.g. pay the staff, feed the children, etc.). So, in order not to be dependent on any charity in future, they have resisted the temptation of raising money for buildings, instead deciding to use what capital contributions they can get now to provide the foundation with an income for many years to come in order to fund their community development activities. To achieve this it has chosen to use capital funding to plant cashew trees to provide it with a long term and ongoing income and started a cashew plantation just outside Bamboi. It's a good approach as their chosen method will help Bamboi not only socially, but also environmentally and economically. 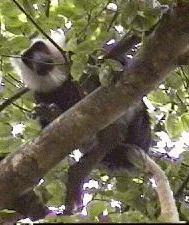 From February to April I worked in Bamboi on a Colobus Monkey Research Project. The purpose of the project was to monitor and survey the supposed local population of Colobine monkeys and to conduct a bio-inventory of the wildlife in the area. As we had difficulty in finding any wildlife other than birds, I undertook, as part of the project, to attempt to tap the indigenous knowledge of the wildlife species of the area and see if the local hunters and rural community could give us information leading to locating some wildlife. Unfortunately, despite receiving a wide range of information, none of this research led us to spotting any monkeys. The only monkeys we saw in the working area were a dead adult Red Patas, slung over a hunter's shoulder, and two orphaned infant Red Patas monkeys, brought to us, separately, by people trying to sell them to us after hunters had shot their mothers. The sad truth appears to be that the wildlife of the area has been all but wiped out by human presence. Both indirectly, by population pressure destroying habitats and directly, by hunting for "bush meat". The locals eat just about anything and everything. I saw cooked giant cane rats (a local delicacy) and barbequed bats. And, yes, the locals eat monkeys too. Actually, I'd probably do the same if I were in their position. Most locals are subsistence farmers barely growing enough to feed themselves and their families, if they are lucky. The monkeys (what few are left) come to their fields and eat their crops, so shooting them not only provides the family with some meat, but also saves the food they are growing. This is a classic example of why wildlife conservation and human development must go together. 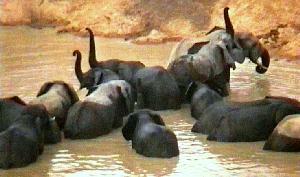 During my stay in Ghana I took a couple of short trips to some reserves in Ghana. At the Fiema-Boabeng Monkey Sanctuary I spotted and got very close to the well habituated populations of Black and White Colobus and Mona monkeys. This sanctuary has succeeded because of an old taboo on the hunting of monkeys around the two villages created by a village priest about 150 years ago. At the Mole National Park I saw Green Vervet monkeys, baboons, wart-hogs, crocodiles, various types of antelopes, many birds and lots of elephants. Walking in the park accompanied by a guide with a rifle, I managed to get quite close to most of the animals. A bit too close in one case when we were charged at by an elephant known as Old Man. He ran at us with his ears fanned out looking as big as, well, an elephant and, thankfully, stopped about five metres away and then walked off. The guide not only didn't move, he didn't even flinch! After Ghana I went back to England for a few weeks and then onto Italy for a short term workcamp. This workcamp was held in the seaside town of Agropoli, about 75kms south of Naples. The work consisted of cleaning the banks of the local river and making riverside paths so that people can enjoy the local environment. Accommodation was in a local primary school, and a lot of the group's spare time was spent on the beach. We also visited Pompeii and Paestum, the local centre of Magna-Grecia. Due to the lack of a full-time co-ordinator this was probably the laziest workcamp I've ever been on! I then went onto a workcamp in Tuzla, Bosnia. The workcamp was supposed to include the reconstruction of a kindergarden (which is why I went! ), but by the time we arrived the kindergarden had already been rebuilt, so the workcamp concentrated on playscheme activities at an orphanage in Tuzla and the painting of a mural on the walls of one of the buildings of the orphanage that had been damaged by shrapnel. The group amused the children, aged from 8 weeks up to 20 years, for nearly three weeks, helping the staff take care of the younger ones and organising various activities for the rest. The mural took a considerable amount of effort too. The group lived in a kindergarden in Tuzla in rather cramped conditions and using furniture designed for 5 year olds! One weekend the group visited Sarajevo and we saw both the beauty of the city and just how much devastation war can cause. This was my second time in Sarajevo since the end of the war, and I was delighted to be able to spend more than the four hours I'd been then when working with the aid convoy last time. I got a good look round this time, especially at the old part, which is being rebuilt and will soon, once again, be one of Europe's most interesting cities. The tourists are beginning to return too. I also took a trip to the suburbs, along the road that we came in on with the convoy, and found that a lot of rebuilding still needs to be done. The ex-Serbian part looks just like it did immediately after the war: a collection of half destroyed buildings covered in shrapnel and bullet marks. After Bosnia, and a brief visit to the interesting Croatian town of Split, I went back to Italy for yet another workcamp. This workcamp was held in the national park Parco dei Centro Laghi (Hundred Lakes Park) in the Appenines on the border between Tuscany and Emilia- Romanga near Parma. The work consisted mostly of making paths and erecting signs for hikers. The accommodation was luxurious by workcamp standards as we were staying in a comfortable refuge within the park. There were lots of long walks to various mountain peaks and several people braved the cold lakes and went for a swim (not me!). At the weekend we visited Parma and consumed large amounts of free prosciutto at Parma's annual prosciutto festival. The workcamp was delightfully musical with several people playing guitar and singing. I then went to the south of France for a couple of weeks thinking that I would actually do some (paid) work for a couple of months, but the contract didn't work out. So, I went back to England for a couple of weeks and then went to Spain to try and learn some Spanish in preparation for my coming trip to central America. As those of you that know me know, I'm pretty lousy at languages, so I wasn't expecting too much. I did, however, pick up what I can only call "tourist's survival Spanish". And in the process I managed to see four quite different regions of Spain, spending two weeks in each of Barcelona, Seville, Madrid, and San Sebastian. I finally returned to England a week before Christmas. Mother expects to see me! I'm off to central America very soon -- my first time in that region. I'll start in Costa Rica working with a marine turtle reseach project, then I'll go to Nicaragua to join an archaeological survey, and after that back to Costa Rica for a cloudforest conservation programme. After that....no fixed plans yet, but May onwards I intend to be, you guessed, in Italy! As always, I hope I'll meet some of you during my travels!